The VW Amarok is among the best and freshest one-ton pickups on the global market. Recently redesigned in late 2016, the model boasts refined and smooth V-6 turbodiesel engine combined with modern exterior and interior design. The model is also packed with modern tech and convenience features but lacks some of the active safety systems. VW upgraded model’s towing capacity to 3, 5 tons thanks to some structural upgrades for the 2018 model year but there haven’t been other powertrain or equipment changes. Luckily, the price also remains in the same range. 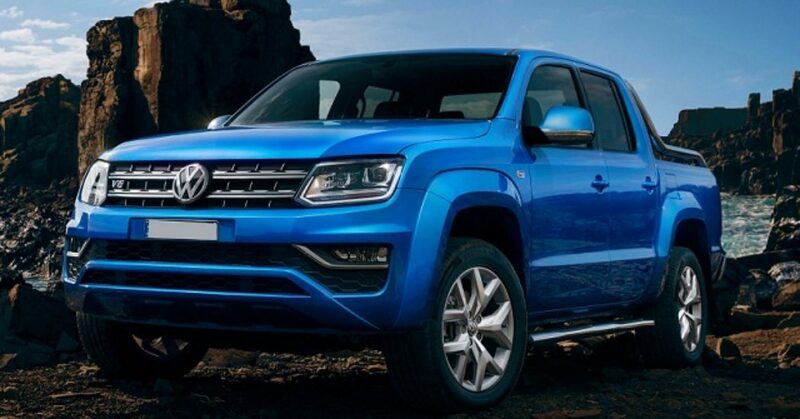 As for the upcoming, the 2019 VW Amarok version, reports suggesting some equipment and lineup upgrades but a new more powerful version is also possible. Additional, up-scale trim option is also reported plus VW might add some of active driver assistance systems. From the visual perspective, the 2019 VW Amarok won’t differ from the current version as it features brand’s latest design language. The model has the front fascia design inspired by brand’s SUVs and includes horizontal two-slat style grille flanked by headlights. The Amarok is also defined with swollen fender flares and simple tailgate with vertical taillights. The new model year might bring new up-scale version with unique cosmetic enhancements including special wheel design. The base version will ride on the 17-inch wheels and wear body colored bumpers and side mirrors. The higher-spec versions will upgrade with 18-inch alloys, chrome grille, DRLs, fog lamps, etc. The top-of-the-line versions will boast 19-inch alloys, special badging and more brightwork. Inside the cabin, buyers will feel like driving in some SUV model. The dash design and comfort will resemblance more passenger-oriented models. The model will likely return in the double cab style only and therefore, the rear passengers will also have plenty of comforts. The level of equipment will also be generous. The entry-level version will offer electric heated mirrors, air conditioning, touchscreen interface, etc. Upper trims will add two-zone automatic climate, upgraded upholstery, 14-way power and heated front seats, upgraded infotainment system and more electronic aids. We also expect an introduction of some active safety systems. On the performance front, the 2019 VW Amarok will again be powered by the wonderful 3.0-liter V-6 turbodiesel engine. This engine will again be available in 201 and 221 hp variants. Across the range, the engine will be combined with the 6-speed manual or 8-speed automatic gearbox. The rear-wheel-drive combination will be available alongside the 4MOTION all-wheel-drive system and Torsen center differential. The towing limit will stay at 3.5 tons. However, based on some reports, VW might also offer a more powerful V6 TDI option for the new model year. The most potent version should produce 254 hp and come combined with the permanent all-wheel drive and automatic transmission. The 2019 VW Amarok should arrive in late 2018. The price range will again have a similar starting point as the current version. If VW offers new up-scale and more potent version, it will push the price limit higher than on the current top-spec model.